Chris Brown performance in Mombasa Kenya has been overshadowed by the fan who accused him of smashing her phone. Brown says the Kenyan woman who accused him of snatching her iPhone and smashing it is lying and only looking for freebies from him. There's also a video that appears to back his claim that he didn't touch her phone. According to TMZ, sources close to Chris say the Kenyan woman who claims Chris grabbed and tossed her phone was harassing Chris at the airport for a selfie and free ticket to his show but Chris told her NO. Chris claims that at no point did he make any form of physical contact with the woman or her phone. A video shot by a fan seems to back up Chris' story. 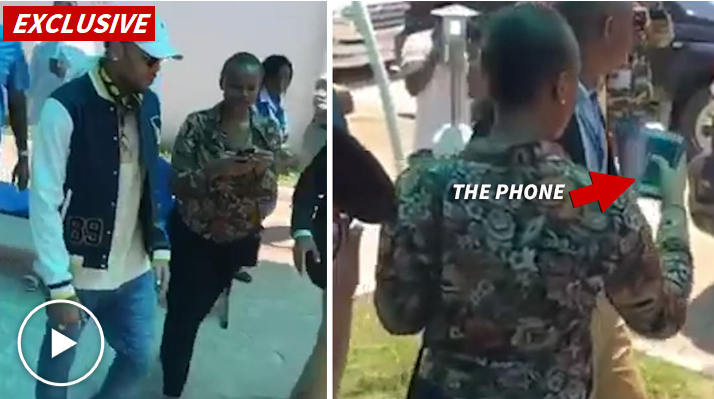 In the video, you could see him walk past the woman, and her phone was undamaged after the exchange between her and Chris. Chris and his team think the woman made the accusation only because she initially wanted free tickets but when that didn't work, she decided to turn it into a monetary gain for herself.